This is a question I am asking fellow fixed riders, you may find the answers interesting. Over the years, Gerry has talked many people into riding fixed, including me. He says riding fixedwheel helps develop a smooth and efficient pedalling style. It also discourages overgearing, a fault of many novices. Early in a cycling career pedalling cadence can be improved much more quickly than strength can be gained, so riding a moderate fixed gear ratio can help improve speed. Dave was converted to fixedwheel riding in the late 1970s as a touring cyclist. Once the delights of feeling at one with the bike were realised by dispensing with the sloppy freewheel, he never looked back. His love affair with the cog soon moved into racing as he realised he was far more consistent in club 10s than he ever was on gears. By the late 1980s his racing bike had changed from a 14 speed road bike to a 24" front wheeled track bike with a single front brake and 165mm cranks. He also points out that the national competition records for 10 and 25 miles were both done on fixed. From Tallahasee, FL, USA loves the honesty and directness of riding fixed. It makes his cycling a constant challenge, he uses a 65" gear and takes great pleasure in keeping up a high RPM during his lunch hour ride. Former Team Spirit rider Kev Fletcher has promised to put pen to paper, but in the mean time he has been heard saying, fixed is like a drug, once you have tried it your hooked. As I have already said on the Steve Morris page, the reason I first started riding fixed was due to an illness. Before the illness I used to ride a 57 tooth chainwheel with a close ratio block which left me overgeared most if not all of the time. In my first season of racing after several years off, I managed to knock 5 minutes off my 25 mile personal best using 87" fixed. This is surely a good enough reason on its own to ride fixed, add to this the great feeling when flying along on a light and efficient machine and you will get some idea why I love riding fixed. Keith Murray ( Steve Goff frames ) is a good example of why you should try riding fixed. He holds the North East 10 mile record of 19-57 on 106" fixed, he has done a 50-56 for 25 on the same gear and has a 50 mile PB of 1-41-34 on 110" fixed, you can't argue with that. Allan Nelson tell's me his dad Les swore by fixedwheel, he always said you were much more in control of the bike and you felt part of the bike. First up, I'm not a dyed-in-the-wool fixed rider, I've got a foot firmly in both camps, but if I think I'll go faster just by throwing my leg over a fixed wheel machine just try and stop me! This little piece describes my dabbling with the murky world of time-trialing on fixed, and that feeling of getting dragged into something you don't really understand! 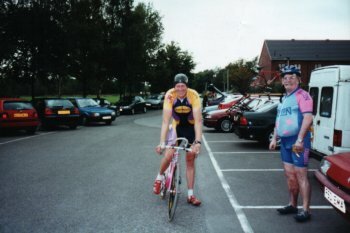 My initial contact with fixed wheel riders was via my club-mates Steve and Kev. Steve was often a bit defensive after he rode, with comments like 'not a day for fixed' sticking in my mind after particularly windy days seemed to slow him down, although it struck me he would always describe losing time on the down-wind leg, and gaining it into the wind. Kev was another matter; always gearing fairly low and having that fluid pedaling action you only seem to see on fixed. Although he was never as fast as Steve his description to me of riding fixed being 'like a drug' stuck in my mind. He wasn't defending it…he was a pusher! I started going to the velodrome after a club taster session, and gradually got used to riding a hired fixed wheel bike, before graduating to my own machine, and 'drop in' training. While waiting for my own session to start, I would marvel at the preceding taster session, with total novices looking wonderfully at one with their bikes, thanks to the fixed wheel bikes they were on. My first experience of riding fixed on the road was in the classic Altringham Ravens medium gear 25-mile, where you are restricted to a top gear of 72". After a disastrous previous attempt on stopped-down gears, I decided to have a go on fixed. The transformation was incredible, and it just felt like the bike pushed me around; accelerating out of corners felt unbelievably zippy, and I knocked 6 minutes off my previous time, to finish just outside the top 10. I had another go at the 'Ravens' the year after, and attacked the ride more. One of the secrets of riding MG events (edit this out if you want this kept secret Steve!) is to make a massive effort to spin your legs on the faster sections. Despite getting a bit of cramp (where riding fixed really is a nightmare), I knocked another 2 minutes off my time, and was up to 8th place. Never one to rush things, I made a new years resolution to do a 'normal' time-trial on fixed this year. After a 7th and 11th place in the local MG events, I bit the bullet and stuck 49x16 and a pair of tri-bars on my track bike and prepared for a hard time. The course was the 10-mile J4/3E (for local riders), a typical Cheshire mix of rough lanes with the odd bit of wide-open A-road. I felt under geared for most of the ride, but perfect on the dreaded last 3 miles into the wind on King Street. I got 6th place, beat a few decent riders, and was overheard going into great detail about how the gear felt on King Street to anyone at race HQ who wanted to listen! A series of 25's and 50's interrupted my experimentation, but I was back with a slightly bigger gear for the next event on the J4/3E, 49x15. The problem was, road works forced the event onto the rolling J2/3 course. This gave me an interesting insight into fixed riding; you have to just 'get on with it'! I got on with it, knocked 1 ½ minutes off my best for the course, and bagged 9th place into the bargain. I was certainly over-geared on the little climbs, but you just get that feeling of all your power going down to the tarmac, which is so encouraging. Mechanical engineers might disagree with me on that, but as so much of this sport is in the head, those positive thoughts really help. More backsliding on gears in 50's, and then my final 'experiment' of the year was on the fastest of the Cheshire 10 courses, the J2/1. It was a windy day, hardest on the longer out leg, and I'd kept on the 49x15 gear. I really wanted to change down on bits of the headwind section, and it didn't even feel that fast on the way back, but I managed to record my second fastest Cheshire time ever, and a respectable 12th place, just behind my fixed wheel mentor Steve. So why ride fixed? Looking through my results for the season seem to indicate 'because it's faster'! Can it be that simple? I'll keep on experimenting, but at least I'll enjoy doing it, because Kev's right…riding fixed is like a drug, a very addictive one. 6. Concentration on the race seems easier to achieve. Stewart gave me a great reason for riding fixed, He claims to be the world's worst mechanic so with fixed there are less bits for him to mess up. I dont know if this is true, but I can say the last time I saw him at an event the RAC had to help him get the car home. o Track bikes look lean and mean. There's nothing on a track bike that isn't necessary. This pleases the minimalist in me! o You're committed to the gear you're on. o You've more control of the bike. o Seeing someone racing on fixed is watching poetry in motion. And my reason for riding fixed is to turn my back on conventional thought I live in the middle of this small metro they call sacramento and I ride brakeless I have the strength in my legs to stop the bike just as well as my calipers do on my old 10speed road bike. I am all for riding my fix or my single speed up next to some guy on a high end carbon multi-speed and look right at him as I pass him the look in their eyes its priceless.... I like the zen of being one with the bike. I ride a steel fixed wheel 200 miles a week all year round. I have rode nothing else for 10 years. It is communion with the road. The hum of the tires and the silent drivetrain - well lubed with a perfect chain line. I like to pass roadies on carbon - I appreciate that sounds conceited but I do! For me - the cog is the only way. 49-16 and that includes Yorkshire dales rides.